Coral Springs Movers – There are many things that go into a move, some of which are needs to be done before the moving day. With decades of expertise, we can walk you through these things, even the ones that are done weeks before the move. Our team of professionals will remove the guesswork and strain in trying to figure everything out. Ask us for a free quote and see why are rates are the lowest around. We can take of any aspect of the move for you from packing to shipping. If you have difficult to move items like pianos, let us set your mind at ease that your valuable items will be securely packed and shipped by out experts. Whether you are moving a small distance away or across the state, residential or commercial, we want to help you with your move. Coral Springs is a large city in northern Broward county, northwest of Fort Lauderdale. The city received its charter in 1963. Coral Ridge Properties, now WCI Communities, was the designer and developer of the city. The land for the city came from a series of marshes that were drained out by canals and levees. Starting in the 70s the city has experienced tremendous growth. The regional economy is extremely vibrant. 24% of the city’s value comes from its commercial and industrial base. That percentage has been increasing over time. The city also offers a favorable tax climate with the lowest rate in the county for a large city. These all contributed to CNN’s decision to name it as one of the 50 best cities in the country. 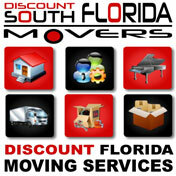 Discount South Florida and Coral Springs movers provide low rates on residential, commercial, piano and long distance moving.